Reverend Emma Chattin Archives - Read. Think. Act. 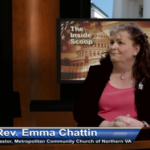 (Dec. 24, 2018) Reverend Emma Chattin, of the Metropolitan Community Church of Northern Virginia, joins Catherine Read for the Christmas Eve edition of Inside Scoop. Their conversation covers Rev. Chattin’s ministry work throughout her career with LGBTQ and transgender individuals. Equality Virginia recognized Rev. Chattin as an “Outstanding Virginian” for her many years of work in planning programming and providing support to LGBTQ and transgender Virginians. After living and working for 18 years in Harrisonburg, Rev. Chattin moved to Northern Virginia in 1997 with her partner Heather. Although she has never been a fan of the traffic in Northern Virginia, she quickly made her home and set down roots in the community. As part of her ministry, Rev. Chattin has been involved with the Transgender Education Association (TGEA) of Greater Washington. The organization has been around since 1982 in various forms, and was on the brink of closing down when Rev. Chattin became involved. She convinced the Board to keep the organization open, and after taking over the reigns she helped to transform it into a vibrant organization it is today. She focuses on providing safe harbor for transgender individuals, while also helping people in this community find their identity. Over the years, the TGEA has worked together with individuals and families to help make the world a little less daunting for transgender individuals. Starting with the youngest members of the community, Rev. Chattin has worked with TGEA to form a playgroup for children ages 5-11. This is a safe space with childcare professionals who are attuned to the children’s needs. While the children play, the parents can find respite with other parents of transgender kids. Again, it is a safe space to connect, find resources and share stories. On the policy side, Rev. Chattin has worked throughout the years with the school systems to develop strong, positive policies designed to keep children safe. She has successfully worked with Fairfax County Public Schools on establishing policies around language regarding gender. This work required long hours of meetings and public hearings in order to ensure that all students are safe and represented. Chattin was pleased to see the outcome, and looks forward to continued work in moving other policies forward. She also works with employers by helping them put good policies in place, even before they may need to have them. On a bit of a more somber note, Chattin points out that the suicide rate amongst transgender children is exceptionally high when children are not supported by the adults in their life. 54% of kids whose parents do not accept them for who they are, will attempt to take their own lives. Statistics show that only 4% of these children will try and commit suicide if their parents are open and accepting. It is so important for parents to try and understand their children, so that they can survive and thrive. Central to Chattin’s ministry is the concept of diversity by God. She preaches that we are all made in God’s image, even people who differ from ourselves. She notes that the Bible has been used throughout history to justify a variety of terrible atrocities, including slavery. As she wisely states, the Bible is like a hammer, it can be used to build us up or to tear us down. 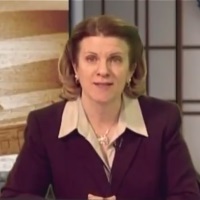 She believes the Bible should be read as a metaphor, with stories dating back thousands years. There is wisdom to be learned but she does not believe that it should be read literally. On this Christmas Eve she wants to send a message of peace and hope, and encourages us all to go out and do good in our community today and all throughout the year.